1. Pumpkin carving – an oldie but a goody. 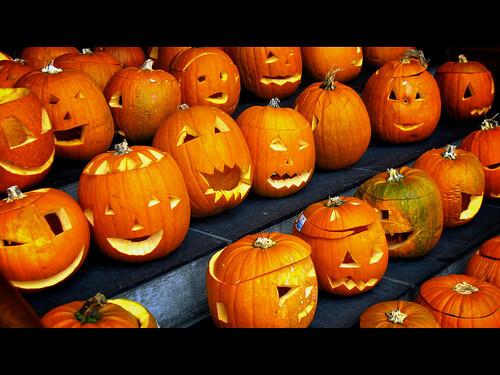 Gather together some pumpkins of different sizes, hollow them out and carve in some scary faces. Don’t forget to put a tea light inside for added effect and to chase off those spooks and ghouls! 2. Trick or treat – dress up the children as a ghost in a sheet, a witch with a wart-ridden nose, or a zombie and take them to play trick or treat with the neighbours! 3. Apple bobbing – prizes for each apple caught. No cheating, hands must stay behind backs at all times! 4. Mask making – gather together lots of paper, crayons, cotton wool and thread to make your own spooky Halloween masks. 5. Eye-popping food – make scary eyeballs out of peeled grapes with a dot of food colouring for the pupils are sure to scare and delight children! 1. Fright Fantastic Half Term Horror at Adventure Island, Southend-on-sea. Special scare zones and a new fright attraction all take place this week! 2. Halloween Trails at Croft Castle and Parkland Herefordshire 10am-4.30pm Normal admission charges plus £2 per trail. Follow the clues to hunt down the ghosts and get your goody bag! 4. Snaglefang’s Spooky Spectacular, Bewilderwood, Hoveton, Norfolk. Lantern and mask-making together with a parade at 5.45pm all this week. 5. Halloween Festival at Marwell, Owslebury, Winchester. Carve pumpkins at the Pumpkin Emporium and hear stories from Marwell’s resident witch! This entry was posted on October 29, 2012, 9:35 pm and is filed under art, Articles, Coast, Cornwall, Cottages Search, Devon, East England, Events, Exhibitions, family days out, Festivals, Food and Drink, Fun, Group holidays, Holiday advice, Last minute breaks, Norfolk, Tips, Uncategorized, West Country. You can follow any responses to this entry through RSS 2.0. You can leave a response, or trackback from your own site.